True Love has many familiar faces including David Tenant (Doctor Who) Billie Piper (Secret Diary of a Call Girl), Jane Horrocks (Absolutely Fabulous), Vicky McClure (This is England), Lacey Turner (Eastenders), Ashley Walters (Inside Men), Jamie Winstone (Kidulthood), and David Morrissey (The Other Boleyn Girl). The series explores love in the modern day and the many different dilemmas and situations along the way. Each story has links with the previous, either through connecting story lines or character connections and all have plenty of drama, heartbreak passion and some surprising outcomes. The five stories that take place during the week-long serial include a married man whose life is turned upside down due to the reappearance of his first love, a school teacher who is drawn to a female pupil, a married woman who takes revenge on her cheating husband by starting an affair, a father unable to connect with his baby and a divorcee on a desperate search for new love. In 2011, Kent welcomed the crew and stars of True Love. 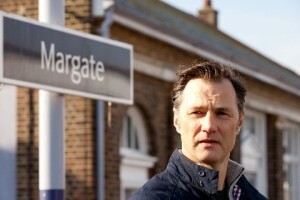 The production based it self in Margate, the director Savage’s home town, and used many Thanet locations including Margate Beach and promenade, Margate High Street, train station, various hotels and bars and even Thanet District Council Offices. They also used the Turner Contemporary, as well as nearby Westgate-On-Sea, Cliftonville, Pegwell Bay, Botany Bay and Broadstairs. Thanet has an astonishing 9 Blue Flag beaches and is a very popular filming location, due to its beautiful bustling seaside towns. It previously welcomed many TV and film productions, including Hancock and Joan (2008), Last Orders (2002) and a McDonald’s Happy Meal Commercial. It is also home to the Turner Contemporary art gallery, adjacent to Margate harbour, which was built to contribute to the regeneration of the town and is fast becoming a highlight of the British visual arts scene. It also hosted the first public screening of the opening episode of True Love on 29th March 2012. 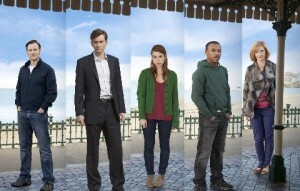 True Love will air every night on BBC One at 22.25pm from Sunday 17th – Thursday 21st June 2012. This entry was posted in Filmed in Kent and tagged Ashley Walters, Billie Piper, Botany Bay, Broadstairs, Cliftonville, David Morrissey, David Tenant, Dominic Savage, Jaime Winstone, Jane Horrocks, Joanne Froggatt, Kaya Scodelario, Lacey Turner, Margate, Pegwell Bay, True Love film locations, Turner Contemporary, TV Drama, Vicky McClure, Westgate-On-Sea. Bookmark the permalink.